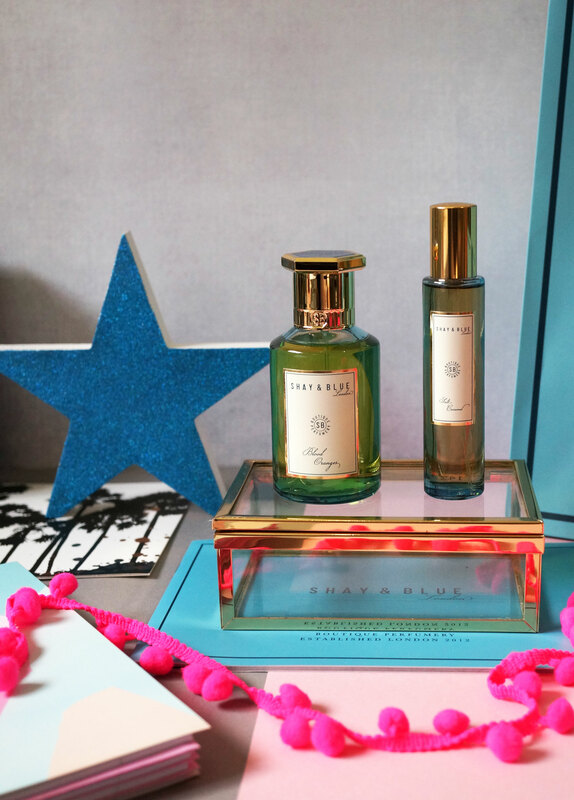 I was recently introduced to Shay & blue – a cruelty free, award winning boutique perfumery established in 2012. I visited their flagship store in Marleybone, London, to experience their fragrance range first hand, and hear more about the brand. Very much in the same vein as Jo Malone, Shay & Blue offer an antidote to the mass produced ‘off the shelf’ fragrances we are all overly familiar with. Shay & Blue founders Dom De Vetta and Julie Massé joined forces and combined their talents to create a brand that offers richly decadent fragrances which convey their personal passion, as well as attention to detail where it comes to boutique perfumery. Shay & Blue tick all the boxes when it comes to packaging too; their bottles all follow a classic style that is nether too feminine or masculine. 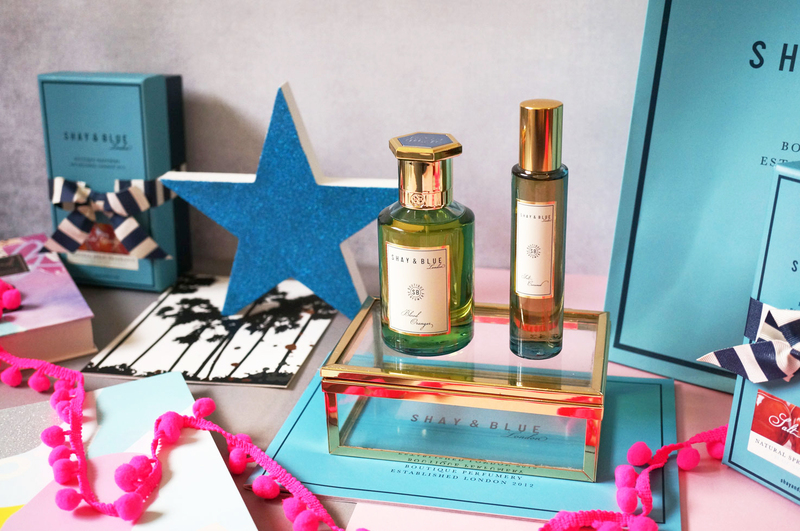 Their striking sky blue packaging is instantly recognisable, and all purchases are carefully boxed, detailed with an individual bow, and packaged in Shay & Blue bags. I know packaging is just packaging, but these extra touches really do make the buying experience that much more enjoyable. I was invited to try out Shay & Blue’s extensive range of 20 perfumes, and to select my two favourites. The first scent I was instantly attracted to was Blood Oranges EDP – Blood Oranges is just the most mouth wateringly juicy scent I’ve ever come across. I’m a big fan of any fragrance with orange notes anyway, but Blood Oranges really is something else. Handcrafted with real flowers, fruits and spices, I was amazed to find out this perfume contains three pounds of real fruits! Blood Oranges opens with quite an unexpected intense and juicy hit of Blood Orange segments at the top – I say unexpected because this is a very different orange scent to anything I’ve tried before. This bright and refreshing opening soon develops into a heart of sensual and intense Nappa Leather, which is then rounded off perfectly with a base of sultry and passionate Musk blended with charred Woods and Amber. This is such an unusual scent, refreshing and mouth-wateringly delicious, then within a matter of hours, warm and sensual – it’s definitely a must try. Top Note – Blood Orange. Heart Note – Napa leather. Base Note – Musk, Woods and Amber. Ok so Salt Caramel is obviously a fragrance for those with a sweet tooth – it was inspired by Charbonnel et Walker’s luxury Sea Salt Caramel Truffles after all! It’s an amazingly rich and multi-faceted scent opening with top notes of gooey liquid Caramel offset with Sea Salt, to give a fantastic olfactory contrast. The smooth heart of Tonka Bean then leads to a base of refined Bourbon Vanilla with Sandalwood as a woodsy counterpoint to the sweetness. Salt Caramel is a simply irresistible fragrance – indulgent and rich, a naughty dessert that you just have to have. Top Notes – Caramel and Sea Salt. Heart Note – Tonka Bean. Base Notes – Bourbon Vanilla and Sandalwood. If you’re a fan of fine fragrances and you’re yet to try Shay & Blue, you’re definitely missing out, I really can’t recommend these scents enough. 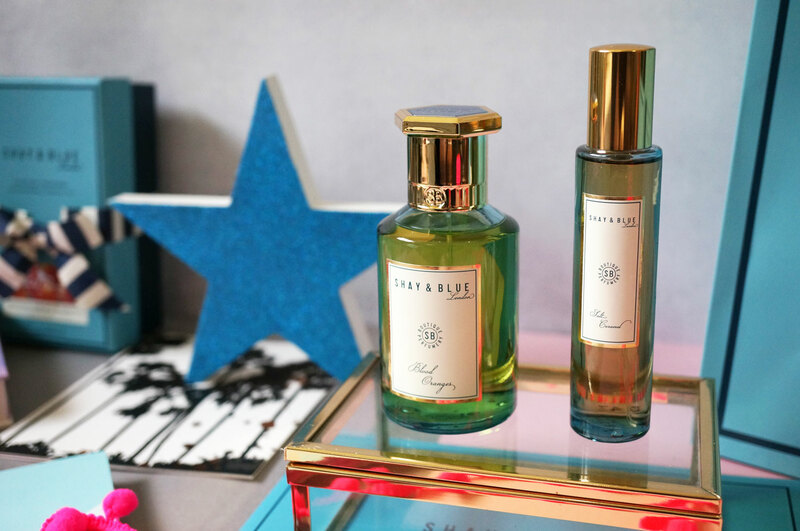 Shay & Blue fragrances are vey reasonably priced at £55.00 for 100ml and £30.00 for 30ml, and are available now at Shay & Blue, John Lewis and Harvey Nichols.